True poker pros are highly skilled in all aspects of the game, and although there are many “good players” out there who only have a relatively limited understanding of the mathematical basis of the game, to become a “great player,” you must also have a solid foundation in at least the most-important aspects of poker math. Lucky for you, we’ve condensed the key concepts in an easily understandable form with numerous practical examples in the video playlist above. This series contains the fundamental knowledge of all “expert poker players,” which is now yours … completely free of charge! In addition to the videos above, be sure to also sign up for our free 12-week advanced poker-strategy course, and check out the informational links below as well as our recommended poker literature and free poker resources pages. 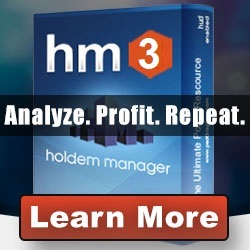 We recommend Holdem Manager’s best-value product HM2 Pro Combo for both Texas Holdem and Omaha. If you’re strictly an Omaha player, get the separate Omaha Manager program here (just click “OM2” in their top menu). We use the Sit-and-Go Wizard (a must-have for all serious SnG players and very useful for MTT pros) that’s directly integrated into the Holdem Manager program. If you’re strictly a SnG or MTT player, you can also purchase it separately by clicking the banner below. Over 40 Hours of Free Poker-Coaching Videos: Official EPK Launch!